Saturday’s UFC 88 event is headlined by Chuck Liddell as he takes on the undefeated Rashad Evans. Rich Franklin will also compete as he moves back to light heavyweight for one night only and fight wrestling power house Matt Hamill. One fight that is not getting much attention is involving former Pride welterweight & middleweight champion Dan Henderson. Henderson’s opponent, Rousimar Palhares is getting less attention despite the hype on his potential in the division. 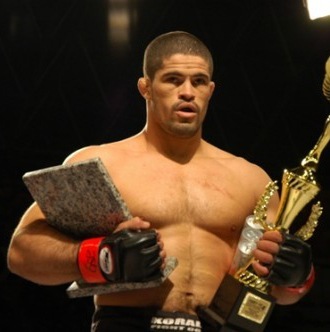 Palhares made his Octagon debut at UFC 84 in May as he dominated the highly regarded Ivan Salaverry and is looking to impress once again and take out the war tested veteran in Henderson. Rousimar Palhares is a young Brazilian standout who made promoters take notice as he fought his way to a 7-1 one record while competing in Brazil. Prior to his UFC debut he defeated Affliction’s Fabio Negao and Pride Bushido veteran Daniel Acacio in the Fury FC promotion on December 6, 2007. Now with his record at 8-1, Palhares looks to catapult his way up the middleweight division with a win in Atlanta. The Brazilian Top Team fighter will look to take the fight to the ground as Henderson has been submitted three times by Brazilian fighters. Palhares is also look to score a measure of revenge for his trainer, former UFC middleweight champion Murilo Bustamante, as he was defeated by Dan Henderson twice. While Palhares has the “next big thing” hype around him, Dan Henderson is one of the most experienced and successful fighter in the sport today. Don’t let two losses in a row fool you because last time I checked, losing to Quinton Jackson and Anderson Silva dose not qualify you for the walk of shame. While this is “Hollywood’s” chance to jump back in line for a title shot, Palhares will have to deal the high pressure atmosphere of bright lights and thousands of screaming fans that the UFC brings, and still find a way and beat the former Olympian. In what is unquestionably the biggest fight in the two year career of Rousimar Palhares, he will have to deal with the Dan Henderson’s high caliber wrestling and his trademark wild over hand right which is one the hardest punches in the game. Palhares BJJ skills on paper suggest he might be able to take advantage of Henderson’s wild punch and take him down. That task is easier said then done as “Dangerous” will be the best wrestler Palhares has ever faced to date. Henderson is not only one of the most decorated wrestlers in mixed martial arts, he applies it better then most. With Henderson’s superior application of his greco skills comes the traditional set back of wrestlers not liking to be on their back which could be the key to victory for “Toquinho” if he can keep Henderson on his back for the majority of the fight. The fans at the Philips arena and the fans watching world wide on pay per view will be in for a treat as the main card is stacked from top to bottom. We will either see Dan Henderson re-establish himself or we will witness the arrival of a new phenom. If fans are able to come down from the nirvana high of the Couture vs. Lesnar announcement, I’m sure we will enjoy UFC 88 Breakthrough. ‹ New Blood, New Battles, and Possibly New Life for the IFL.